Even though we were technically staying in a vacation rental on Grenada, that didn’t stop us from getting to know the Isaacs family who owns it. It was, in fact, their family home until the sisters grew up and moved off the island, as did their father, and the mother Jenny relocated just down the road in with her mom, who has since passed away. Their reasoning for opening Villa Solitaire as a vacation home this past year was because they couldn’t bear to give it up, they wanted to keep it in the family, and I don’t blame them. Simply put, it’s magical. 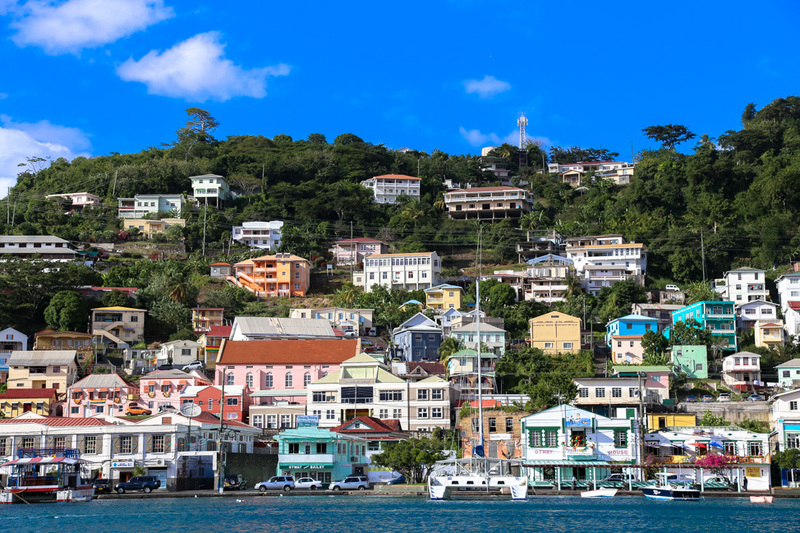 We were happy to get to be some of the first guests to stay there, and even though none of us knew much about Grenada at all before we arrived, there’s no better way to learn the history of a place than from the people who inhabit it, right? Like many of the Caribbean isles, Grenada is a hodgepodge of cultures, the result of having been a French then British colony until its independence in 1974; its early origins date back to the late 15th century when the indigenous communities first inhabited it. After it gained its independence from Britain, however, a dark decade of conflict ensued between Grenada’s first prime minister, Eric Gairy (who was thought to have won based on a fraudulent election), his Grenada United Labour Party and a new party that had cropped up, the Marxist New Jewel Movement (NJM), which continued to gain steam over time. Fast forward a few years, and Grenada was beginning to form close ties with Cuba, who was building an airstrip on the island. A bloodless coup by the NJM led to Gairy’s political demise in 1979 while he was visiting the United States; he remained there in exile for the next four years. With the coup a success, the NJM declared themselves the Peoples Revolutionary Government (PRG). Maurice Bishop, leader of the PRG, established himself as the new prime minister, though he was later accused of not having “a Leninist level of organization and discipline.” The People’s Revolutionary Army (PRA) was formed, and as the PRG sought to make Grenada more like Cuba and the USSR, it—supported by the Grenadian army—overthrew Bishop, first placing him under house arrest and ultimately executing him when he sought to regain power. Deputy Prime Minister Bernard Coard, a Communist, then took over. The island then fell under a Marxist-Leninst militarism and repression ruled by martial law, with Cuba and the Soviet Union supplying the PRA with its weapons, and a mandatory curfew was put into place, stating that anyone seen out after a certain hour without permission would be shot on sight. It didn’t take long for the United States under President Ronald Reagan to arrive a week later to liberate the Grenadians in what would become known as Operation Urgent Fury. It was a move that was strongly opposed by the United Nations, though Reagan had the support of other Caribbean states, and the last example of a successful U.S. invasion. Some soldiers surrendered, while others fled into the jungle or to Cuba. U.S. troops stayed in the island for two months as the government was reestablished, order restored and democracy implemented for the first time. Seventeen members of the top political and military leadership of Grenada at the time of the coup were sentenced to life in prison, naming themselves the Grenada 17. This is obviously the most abbreviated Cliffsnote version of Grenada’s very long and complex history that glosses over all but the most recent struggles, the point being it was fascinating to hear about that decade of conflict from people who lived through it—and not all that long ago either. Westerhall Point, home to Villa Solitaire and the Isaacs’ house before that, was even invaded by U.S. forces when members of the PRA fled to the neighborhood, and Susan, who was just five years old at the time, recalls vividly when the soldiers crawled through her street and forced their family outside on the lawn as they searched the Isaacs’ house and all the others around it. Can you even imagine that all going down in a perfect place like this one? It sure doesn’t feel like such a bloody period in history ever happened to this paradise. Grenada is a volcanic island with a mountainous landscape—its highest peak is 2,757 feet—accentuated by dense vegetation. Its elevation varies around the island; thus, even if you’re just driving a mere five miles, expect that to take a solid 20 to 30 minutes due to the windy, narrow roads. This Caribbean nation is called “the Spice Island” for a reason. Centuries ago, ships brimming with cinnamon, mace and clove crossed the Atlantic to bring their goods to the spoiled Europeans living on Grenada, and spices became ingrained in the local culture early on. Today, scents of cinnamon, nutmeg and ginger still waft through the countryside, and there are a number of plantations scattered around the island that sell these goods are open to visitors. We visited two, which I’ll have SVV tell you about in a future post. Two days after we left the island, Grenada celebrated 43 years of its independence from the Brits. The whole place was decked out in the nation’s signature colors of red, yellow and green for the celebration, and the locals were already prepping for parades and festivities of all kinds. Every year, Feb. 7 is a joyous holiday on Grenada and a great time to be an islander, even if just temporarily. While we didn’t get to partake in all that fun, Susan, Jenny, and various aunts and cousins welcomed us into their family, offering up a vast week-long crash course to this special little island of theirs. That was all the celebration we needed. Once again, I felt blessed beyond measure to be able to travel the world and learn about a new place through the eyes of such kind people as the Villa Solitaire family. Its beautifull blog post andgorgse images. You’re making me fall in love! I hope you get the chance to go eventually, Alyson! Right? It’s got pretty easy airlift from the US and yet many of my friends have never heard of it, too. I do believe you can fly direct from the UK and Germany, as well. How wonderful that you could get to know the owners of the home you were staying in. Such a diferent experience than staying in a hotel or resort. I definitely wasn’t expecting that, but they went above and beyond and took us all over the island! Best trip ever. Wow, I had no idea about any of this history! Some of it is pretty sad, but how cool that you got to hear it firsthand. Your photos of the island are amazing…I want to go! Thank you, Rika! Scott and I definitely felt inspired in Grenada, and I think a general love of a place often shines through in photos. So interesting. Looks like a beautiful island. I think my cousin lived on Grenada for a while, actually, attending med school or something? I dunno, the independence day celebration is ringing a bell, though! Now I’m kicking myself I didn’t go visit them before they left! Dangit! I think you had a great time at Grenada. Your photos look really beautiful. I like the colorful photos of the streets and the nature photos a lot! Grenada looks indeed like a volcanic island with an amazing mountainous landscape. Would love to visit one day!